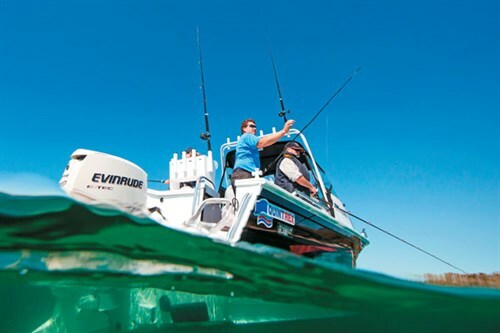 We water test and rate the Quintrex 650 Trident, a contender in the aluminium fishing boats category at the 2014 Australia’s Greatest Boats awards. 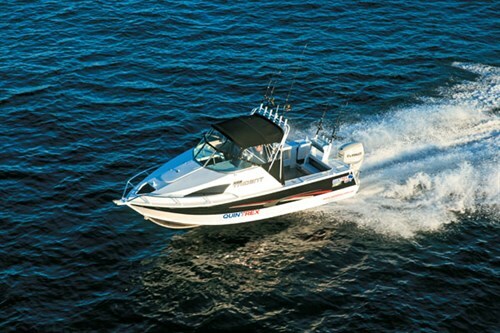 In the aluminium boat world, Quintrex is an Aussie icon. Some years back it also formed the first variable-deadrise hull, the Millennium hull, and now it’s taken that design even further with its recent Blade Millennium hull, as fitted to the 650 Trident. Quintrex’s parent company Telwater has produced plate-alloy hulls in various formats and the 650 Trident features 5mm plate aluminium on the hull with 3mm sides. It’s built with a commercial mindset, having a self-draining deck, but it’s aimed at discerning recreational buyers. It’s a very tall boat with high shoulders and freeboard and a voluptuous walkthrough cabin. There’s a big, open cockpit with a checkerplate floor, tons of storage, a big wetwell, transom door, livebait tank and a berley bucket – all standard features. The cabin has plenty of head height over twin 6ft2in (188cm) bunks. It’s unusual to combine a functional cabin with a full walk-through to the bow but the 650 Trident has done it well. It makes beach landings a breeze and comes in handy for mooring, anchoring and docking, too. The helm is big, high and comfortable, whether sitting or standing. Visibility is excellent and the new upholstered bolster seats are terrific. Offshore the big 200hp Evinrude E-TEC was more than equal to the task, punching us onto the plane with ease and holding high speeds with minimum fuss. This isn’t only a fishing boat, it’s a very versatile family boat and even capable of towing skiers in a relatively narrow waterway. Angelo Sangiorgio: "The all-new 650 Trident provides plenty of features at a very competitive price. We were very surprised with the way it rode and more than impressed with its handling and perf ormance. It’s a big, open boat with plenty of cover and tonnes of access. The forward walkway is a ripper for bow access and the driving position is spot-on whether seated or standing. We loved the commercial boat experience that shows through in its design and construction. It’s tidy, deep-sided, stable and very functional, not only as a fishing boat but also for a multitude of other uses, including watersports." John Ford: "Quintrex is onto a winner with this boat. I like the way it digs in and turns on its solid 5mm base. The cabin is spacious and modern and the teardrop windows look like Prince Planets’ eyes from Astro Boy. The bunks are good and long and there’s plenty of room in the cabin without bashing your head. The scuppers are nice and high and the price is nice and low — she’s a winning package." Kevin Smith: "Another quality boat from Quintrex — high sides, big hull volume and a checkerplate floor; just the way we like commercial boats. It has everything on board for fishing and family and it’s a lot of boat for the money. The available space has been utilised well and the helm is nice and high, giving great vision." Matt Jones: "I was really impressed with the volume in this boat and it’s got the stability you need for the capacity. We all love checkerplate self-draining decks and this one is impressive. It’s easily cleaned with the saltwater wash-down facility and the walk-through cabin makes anchoring easy. I loved the big, high, adjustable seats, which were comfortable whether sitting or standing. " John Willis chats with Damien Duncan (Quintrex): "We’ve put plenty of R&D into the Blade Millennium hull, so it’s soft, it’s dry and there’s no bell effect from the modified bow and entry. We have a tough 5mm hull with 3mm sides, deep 700mm freeboard and a true self-draining deck with ball scuppers. The floor is well above the waterline so even with back door open we get no water in, even when backing up at speed. There’s loads of room for a group of keen fishos with all their gear and it doubles up as a safe and functional family package. At $64,990 as displayed she’s plenty of boat for the money."